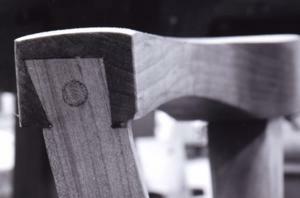 Dovetail Joinery is a universal sign for fine furniture. A person of knowledge will look for Dovetails as an immediate indication of a wood piece's integrity. The best Dovetails are handmade. 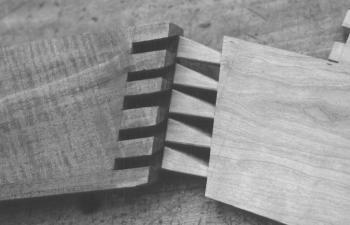 Machined Dovetails are rounded on the inside, lacking surface area, creating weakness. 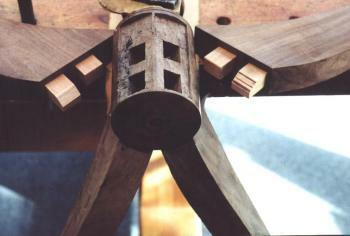 At the turn of the 19th century it was fashionable to form Dovetail pins to a point, making them lean and eventually weak. Many antiques are hindered because of this; the drawer fronts break loose, pins tear out. Many pieces rendered useless. Difficult to repair. A good ratio for Dovetails in hardwoods is an angle set at 1 to 6-8. I use Compound Angle Dovetails for the Bombe' Chest's Serpentine front. The interface of each Dovetail slants, allowing the surrounding wood to angle where needed. An investment joined to last. Compound Joinery is demanding to execute. A rarity unto itself. So many antiques suffer from mismatched wood. 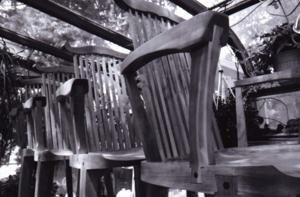 Pine attached to Mahogany is one; they do not expand and contract in harmony working each other loose. Pine for drawer work is inferior. Too soft and unstable. Look at antique casework to see why. Loose (useless) dovetails, grooved races. Drawers with so much slop that they almost (or will) fallout when used. Drawers jams cause the user to invite further damage. Cherry and walnut move in accord; together with the season's change. They are much harder and resilient than the usual wood used in drawer work. Not to mention their stability. Not to mention their beauty. I guarantee a piston-like fit in all my casework, curved or not. You'll enjoy the gratifying feel of a fastidiously fitted drawer on a daily basis.